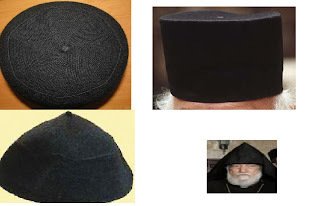 The shape of clergy's cap in the Coptic Orthodox and Indian Orthodox Churches are same but Syrian Orthodox Priest's Cap is very different from others. Why? The Armenian priest wear cloth but do not wear a cap. The Ethiopian priests wear a special cap. Its made of long pieces of cloths (yellow and white etc.). Why the oriental orthodox priests wear different types of caps? All the vestments of clergy which Indian Orthodox Church are using has been adopted from the 'Jacobite Syrian Church', a Church of India within the jurisdiction of the Syrian Orthodox Church of Antioch & All the East. The priests of different geographical area of Syrian Orthodox Church are using caps with slightly different shapes. This cap which u mentioned is used by the Syrian Orthodox Church of Lebanon & Iraq also.